Over the past year and a half, the National Association for Gifted Children (NAGC) worked with experts in the field to develop an outcome-based professional learning opportunity for educators. 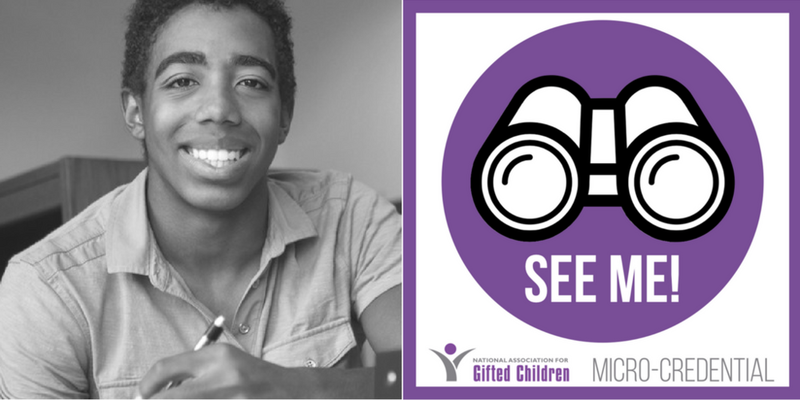 The first Giftedness Knows No Boundaries Micro-Credentials, SEE ME!, launched in Tennessee and was featured in Education Week. A cohort from across the country is also participating in the SEE ME! micro-credential. The Giftedness Knows No Boundaries Micro-Credentials program fills a sizeable gap in accessible professional development content to help educators better identify gifted and talented students from diverse backgrounds and to meet their unique learning needs. By providing affordable, accessible, and outcome-oriented content from experts in the field, NAGC Micro-Credentials are designed to help classroom teachers develop and master skills to effectively work with all gifted children. Federally-funded research shows that gifted children living in poverty and from ethnic and language minority groups are 250% less likely to be identified for, and served in, gifted programs in their schools, even when they achieve at the same level as their more affluent identified peers. A gifted coordinator who participated in the Tennessee cohort said, "It feels so wonderful to have support from a National and State level...I so often feel my voice is a minority voice, weakened by other initiatives and priorities. Having [NAGC's] support, leadership, and the state's involvement really beefs up the credibility of what we are trying to help teachers understand." NAGC will open a new national cohort this fall, and three more micro-credentials will be available by November. Click here to receive more information. "Many of our Brightest minds get lost..."
James Webb, a renowned and influential psychologist who established SENG (Supporting Emotional Needs of the Gifted), shares his thoughts on the importance of the Giftedness Knows No Boundaries campaign. M. René Islas, executive director of the National Association for Gifted Children, with Tyne Watts. I attended my first summer camp at 6-years old. After that experience, I looked forward to attending every year. At summer camp, I was exposed to new things with friendly staff in a positive environment. During one year of summer camp, the academic enrichment was so great that I was able to test out of the traditional 2nd grade math program when school started. My school created a special math program for me and a few other students who attended the same summer camp with me. Two years later, I found myself being identified as a gifted student and math is one of my favorite subjects. Even though all camps don’t offer academic enrichment, they do expose kids to lots of new concepts and ideas that are valuable. I think all kids deserve stimulating opportunities like that during the summer. Maryland’s Governor Larry Hogan of Maryland issued an executive order in 2016 mandating that all Maryland public schools start after Labor Day. The executive order cites the August heat and state economic deprivation as reasons for the mandate. Starting school later may help Maryland’s workforce and economy thrive, but it also creates an additional stress for working parents who can’t stay home with their children for an additional 1 or 2 weeks. Where I live in Prince George’s County, a very few camps have extended sessions to accommodate parents, but they may not have plans for additional activities that will engage campers. As a second year Girl Scout Cadette, as well as a gifted student, it is my duty to help my community flourish and grow. In attempting to help the gifted student population increase, I plan to help those extended camps by providing them with materials to expose students and parents to gifted education along with thought-provoking activities to try during those last camp sessions. I hope to help more children have an opportunity like the one that I had 7 years ago. With the support of the National Association for Gifted Children, I will be visiting summer camp locations with extended sessions in Prince George’s County, and I will distribute packets of fun ideas for camps and information for parents on the importance of gifted education. Tyne Watts is a rising freshman in the LEAD engineering program at Elizabeth Seton High School in Bladensburg, MD; a top tier ranked MD state level 8 USAG gymnast; and a candidate for the Girl Scout Silver Award with Cadette Troop 4041 at Ebenezer A.M.E. Church, Fort Washington, MD. Did you like the Gifted Minds posters? Help communicate policy solutions that will promote programs and services in which gifted and talented children will thrive. In the next few months, NAGC will release detailed policy advocacy briefs building from the Solutions Set. By sharing these resources, you will help us engage others to focus on changing policies. Advocates for gifted education distributed over 6,000 prints of the Gifted Minds posters, and electronic versions proliferated over social media channels like Facebook and Twitter. These resources help broaden the public's understanding of the unique nature and needs of gifted and talented children and help us with the goal of increasing the urgency to support their needs. Thank you for being an advocate for all gifted children! M. René Islas, executive director of the National Association for Gifted Children, joined Marc Webb, director of the film Gifted, for a chat with Larry Jacobs on Education Talk Radio. The film peers into the complicated process of educating gifted children and provides a hopeful reminder that we must not only see these children, but must understand, teach, and challenge young gifted minds for their sake and not ours. "It is our hope that Gifted will raise awareness about the need to support gifted and talented children to become what they are, not what we want them to be," said Webb and Islas in The High Flyer. "We see the challenges that Mary and her uncle face, and we learn that obstacles can be overcome. As Mary’s uncle said, 'I must be doing something right.' Let’s all do something right and ensure that everyone truly understands the challenges facing gifted children and their families, especially those in poverty and from minority groups." This past February, M. René Islas, executive director of the National Association for Gifted Children joined more than 250 parents, teachers, and advocates for gifted children to walk the halls of the Washington State Legislature and testified before the Senate Education Committee (read remarks). We are all united by the common vision of a nation where giftedness and high potential are fully recognized, universally valued, and actively nurtured to support children from all backgrounds as they reach for their personal best and contribute to their communities. A version of this post appeared on The High Flyer blog. Vanderbilt University's Donna Ford, a leading expert in gifted education, highlights the importance of expanding the boundaries and supporting families of gifted children. Take on Talents is focused on gifted children and their parents/educators. They believe all gifted children should be able to make the most out of their talents. Claire Hughes says, “Every gifted child deserves the right learn something new,” and she shares her thoughts on the Giftedness Knows No Boundaries campaign.